When Steven Stamkos went down to injury, the Tampa Bay Lightning needed Valtteri Filppula, their five-year, $25 million man, to step up to the plate and deliver. Filppula has answered the call with balanced point production and clutch goal-scoring, enabling the Lightning to stay near the top of the Eastern Conference standings despite losing one of the NHL's elite forwards for an extended timeframe. The Finnish-born forward had his 10th multi-point game of the season (T-17th in the League) Wednesday when his team triumphed on the road against the Vancouver Canucks. Filppula, who has points in seven of his past eight games with a total of 12 in that span, is one of 24 players League-wide with 15-plus goals and 15-plus assists. Much of Filppula's damage since signing with Tampa Bay has come late in games; eight of his 15 goals have come in the third period. His high point of the season came against the New York Islanders on Dec. 17, when he single-handedly helped the Lightning force overtime with two goals in the final three minutes of regulation. Additionally, Filppula's efficient goal differential (43 team goals vs. 28 team goals allowed while on ice) and power-play prowess (12 PPP in 40 games) make him invaluable in multi-category leagues. This is the same player who was far from a given in terms of fantasy value coming into 2013-14. From a fantasy standpoint, owners who took a chance on this longtime Detroit Red Wings forward -- who had only once scored more than 40 points in a single season (66 in 2011-12) -- are reaping the benefits of one of the League's surprises based on average Yahoo drafts (average pick: 155.8; average round: 13.8). Filppula, whom I recommended to add when Stamkos sustained a severe leg injury on Nov. 11, has proven he warrants a spot on your fantasy roster moving forward. He's dual-eligible (C/LW) in Yahoo leagues and is on the cusp of top 100 overall territory. He's been scooped up in most leagues at this point, but his Yahoo ownership still only stands at 54 percent. If he's on your waiver wire in shallow leagues, he's an absolute must-add. Prior to the game in which Stamkos was injured against the Boston Bruins, Filppula saw 20-plus minutes of ice time in five of 16 contests (31 percent). Since then, he's exceeded that number 14 times in 24 games (58 percent). He's been skating primarily alongside Alex Killorn and Teddy Purcell at even-strength, and has also made his mark on the Lightning's top power-play unit. Tampa Bay has Martin St. Louis on another line, maintaining scoring depth despite being without its No. 1 center. 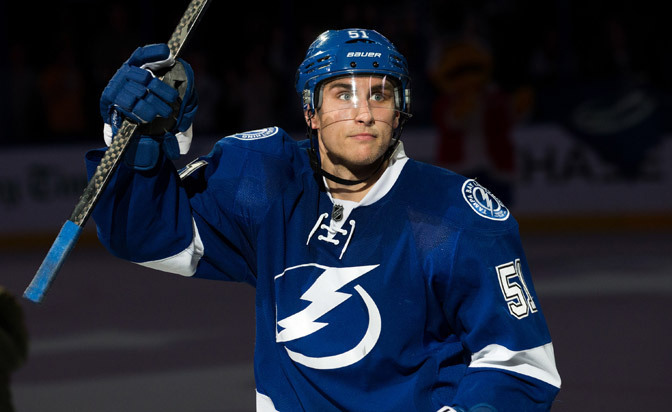 Though it was easy to expect the Lightning to show an added dependency of Filppula given the circumstances, his ability to excel speaks volumes of his leadership and has helped lift his fantasy stock to new heights. Even if Stamkos returns in time for the Olympics, Filppula is locked in and will be featured in the Lightning offense for the long haul.